Written by Travel Excellence The Costa Rican Association of Tourism Professionals (ACOPROT) will bring together over 300 representatives of tourism companies from Costa Rica and Central America in the EXPOTUR 2012, the main event for the area’s tourism marketing, where companies promote the best tourist attractions and the rest of the region. Expotur is an excellent trading platform for those companies which seek a consolidated event, successful which offers the best conditions for investment return. The activity will exhibit and promote a wide variety of quality tourism products and services from the best of Costa Rica Hotels and Resorts to the most exciting vacation tours. Besides, the supply of services will have from tour operators, airlines and accommodation, to specific products such as eco-tours, water activities, honeymoon packages to Costa Rica, among a wide variety of tourist services and activities in Costa Rica and Central America. The international fair will be held from 9 to 11 May next year. Airlines, tour operators, car rentals, hotels, villas and other tourist companies and services will be shown to the world. Costa Rica offers an interesting variety of products for companies which seek special and specific services for its customers such as 4x4 Rental, Costa Rica fishing packages or photography tours, among other. 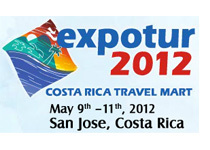 Expotur bidder companies represent all Costa Rican and Central American regions. In addition, a group of international wholesale business buyers from three continents will attend the event to know more about the big services supply the area offers and to negotiate and seek new options for its customers. They represent tour operators, wholesalers, meeting planners, incentive travel and corporate travel, among many others. Local and international media such as Recommend Magazine, Travel World News, Conde Nast Traveler, National Geographic, Miami Herald, Travel Weekly, Televisa, and the Canadian Tourism Business Traveler have given not only coverage the event, but also to Costa Rican destination, its products, services and attractions.